Actor Tim Abell is a very interesting individual, to say the least. A teacher of ballroom dancing, a horse trainer, a writer, martial artist, boxer, cook, producer, and Army Ranger, Tim’s foray into acting seemed to solidify all the various roles he has played throughout his life. Time grew up in the Maryland/Virginia are and has a deep respect for nature and wildlife. After joining the army at the age of seventeen, Tim got his first taste of acting when he played the role of General Robert E. Lee and Andrew Jackson during a dramatic re-enactment, arranged by the U.S. Army, of the History of the United States Torch Light Tattoo. The performance occured at the Jefferson Memorial in Washington D.C. and a longer version called “The Spirit of America” was subsequently performed in various location. After five years of service, Tim left the army and went to college where he joined the Arthur Murray Dance Studio and ended up teaching classes whilst putting himself through school. Through this position, he entered local theater and quickly decided to leave college and try his luck in Los Angeles. Tim found work in numerous low-budget films and got his big break in 1997 when he appeared in the television series “Soldier of Fortune” as scout and sniper Benny Ray Riddle. Since then, he has continued acting and even appeared on smash hits like “Murder, She Wrote” and “CSI: Miami” as well as in the film “We Were Soldiers” where he starred alongside Mel Gibson. Tim soon found that he truly enjoyed working in costume dramas and has also dabbled in co-producing award-winning projects such as “Soldier of God”. Most recently, Time starred in a horror movie titled “Circus Kane” which is slated to be released in September of 2017. 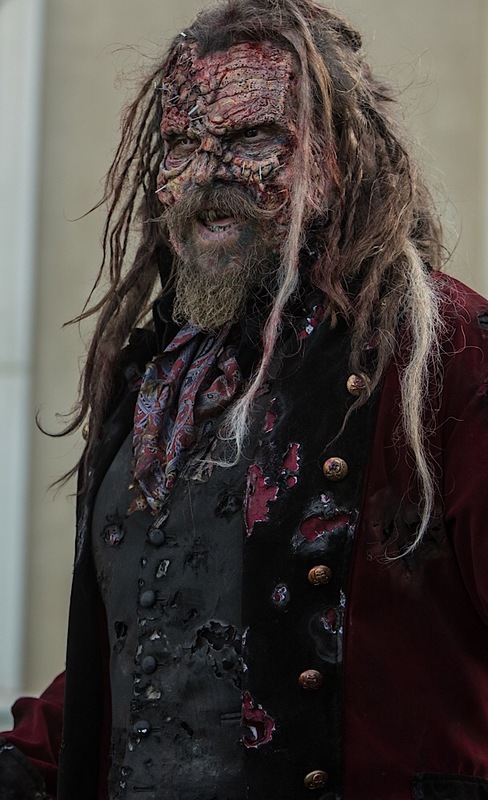 Tim plays the role of Balthazar Kane, “the ringmaster of horror” and he enjoyed every moment of it, as he explained in a recent exclusive interview. Meagan Meehan (MM) of Movie Vine: What inspired you to become an actor early-on? Tim Abell (TA): When I was serving in the Army as a Ranger, I used to love to go to this old theater near base that showed old black and white classics as well as foreign films with subtitles. I loved movies as a kid, but this experience really deepened my love and appreciation of the filmmaking process, the directors and most of all the actors and their transformation into the characters they were portraying. I had read Stephen Kings, “The Shining”, and was looking forward to Stanley Kubrick’s film version with Jack Nicholson and Shelly Duval. When I saw it at the theater, I was blown away, especially by Jack Nicholson’s performance. That was the first time I thought about how cool it might be to be an actor. MM: How did you secure your “big break”? TA: I look at my career as an actor having two big breaks. One would be my being cast by April Webster in Jerry Bruckheimers new TV series “Soldier of Fortune Inc.” It was quite a long shot but my then manager, Daniel Del, was miraculously able to get me into the casting session by pulling in a few favors after I pleaded with her that I was the character they were casting Benny Ray Riddle. That was such a blessing at the time. I was bartending, building sets, catering, taking acting classes, auditioning and getting the few jobs here and there to take care of a wife and son, so being cast as a series regular on a Bruckheimer TV series was huge! The other big break, which was just as important to measure, was meeting director Fred Olen Ray while bartending at Le Cafe restaurant and jazz club in Sherman Oaks. He cast me in a film he wrote and was directing called, “The Attack of the 60Ft Centerfold” which led to sixteen more films with Fred and a life-long friendship as well as having met his son, Chris Ray, who is the director and producer of “Circus Kane”! MM: How did “Circus Kane” come about? TA: I had literally just wrapped filming a project called “Trouble Creek” and was driving off the location set to head home when I get a call from Chris Ray asking me about my schedule and might I be interested in playing a Rob Zombie type “Circus Master of Horrors” show character in his new film “Circus Kane”. Of course, my interest was peaked after he described Balthazar Kane and the “Circus Kane” script. Chris and his partner at Deinstitutionalized Films, Gerald Webb, would be producing. I read the script that night and quickly agreed to play Kane. This was my first feature length horror film and I was very excited to discuss the look that would become Balthazar Kane. From the costume, to the dreadlocked hair, to SXF makeup…I was looking forward to this new and crazy experience! Once all these were in place and I looked into the mirror Balthazar Kane was born! Funny enough, I was NOT a horror fan as a child. I remember my family watching a film called “The Haunting” with Julie Harris and it freaked me out! My Mom had to stay with me in my bunk bed until I fell asleep because I was just too scared! It wasn’t until I saw “The Shining” that I gained an appreciation for the horror genre. Now I absolutely love horror movies that can get a reaction out of me, scare me so bad that they make me afraid to turn off the lights. I love a good scare! MM: What most appealed to you about the movie “Circus Kane” and your character, Balthazar Kane? TA: What most appealed to me was delving into the bizarre mind of Balthazar Kane because he’s a complex individual: an entertainer, a lover, a father, a sadist, a magician., a genius, and a mad man. Digging deep into one’s own soul to mine what’s needed can be enlightening and disturbing but it all resides in our baser instincts just below the surface. I wanted to find out what makes Kane tick and with director Chris Rays guidance and allowing me the freedom to explore and riff, I found the ‘Kane’ who resides in my core! TA: Four to five hours of SFX make up application was required including hair extensions and special contacts! It was all very relaxing to me and time to get into character and think about the scenes. The only part that took some getting used too were the special Kane teeth that were molded for me. But after about an hour I was good to go! The make up the hair the clothing the teeth all gave me a sense of empowerment, freedom to do WHATEVER I wanted vocally or physically. MM: Are there plans for a series of films based on the Balthazar Kane character? TA: I’d be thrilled if “Circus Kane” became a franchise. Perhaps “Kane Rising” would be a good title! Taking Balthazar Kane to the next level would definitely be a challenge I’d like to take on. As an actor, I feel that I am currently doing some of my best and most gratifying work. The parts I’m being offered and cast in now are so much different than what I was doing twenty years ago. I believe that life has defiantly made me a much more present and intuitive actor. I just wrapped “I am that Man,” “White Blood” and “Trouble Creek” and all three roles challenged me and took me deep within myself to find the monsters that live there. MM: You’ve done so many things in your life, how do you brace yourself to leap into so many different fields and embrace so many varied experiences? TA: I was the youngest kid in my family and when I was eight my mother left. My siblings and I became ‘latch key’ kids who had do take care of ourselves. My father was a good man who worked hard as a mechanic at a Cadillac dealership for forty-seven years and he always had a roof over our heads and food in the cupboard for us, but we needed to make our own meals, pack our own lunches, wash and mend our own cloths, clean the house, take care of the yard and help our dad work on cars on the weekends. It made us stronger, self-reliant and capable of taking care of ourselves then and later in life. Growing up in that environment has made me appreciate all the perceived hardships we had to deal with and it made me a better man than I would have been without those challenges. MM: How, if at all, did your time in the Army impact the creative projects that you choose? TA: The military has had a huge impact on my life. Every day you wake up in the Army there is a mission and purpose that must be tackled, dealt with completed, subordinates that need direction, higher ups that need to know you have the initiative to complete the mission assigned, the TV and film industry operate similarly. Teamwork is mandatory, slackers will be disciplined, whining will not be tolerated and you have to pull your own weight and do more than is expected. I love working on projects that work this way, from the script to the director to the producers to the cast and crew. I believe that director Chris Ray is an awesome director due to his military experience in the Navy. He brings character, integrity, leadership and passion to his work on the set and sets the tone and example for others to follow. MM: Who are some of the most famous people you’ve ever met while working in entertainment? TA: I’ve had the good fortune to meet and work with many wonderful “famous” people through my career as an actor and in jobs I had while training to be an actor. I started off as DB Sweeney’s Stand in for a film called “Gardens of Stone” directed by Francis Ford Coppola and also starring James Caan, Anjelica Houston, and James Earl,Jones! I bartended at a little jazz club/ bar and restaurant in Sherman Oaks called LeCafe and met Clint Eastwood, Paul Newman, George Thorogood, Sydney Pollack, Shaquille O’Neil, and Holly Hunter gave me one of the biggest tips I ever got when she came to the bar and ordered a bottle of champagne for another table… I was smitten! I worked with Melinda Clarke, Mark Sheppard, David Eigenberg, Réal Andrews, Dennis Rodman, and Mel Gibson. He was warm and open and told some of us who were actually veterans some great jokes and stories. My favorite was Sam Elliott who came out of his trailer and greeted me with a beer in the base camp lot after I got my military haircut! I was directed by Robo Cop Peter Weller on an episode of “Sons of Anarchy” and got to work with martial arts star Steven Seagal recently in a military film directed by Fred Olen Ray who is Chris Rays father. TA: Do theater, read the classics, find a good acting teacher and coach, read, live, experience life, find a mentor, give back, lose your ego, hike, backpack, camp out, learn to be good at improve, love, learn to sing, learn to dance, love life, debate your friends, laugh much and often, help those that can do nothing for you, don’t take advantage of your friends, be grateful, exercise often, watch classic films, play devil’s advocate, learn another language, get an accent, recite a monologue, get a dog, spend time with your family and…Never Give Up! To learn more about Tim Abell, visit his IMDb. Comments for Interview with actor Tim Abell, star of ‘Circus Kane’ are now closed.